"Terror ... Tension ... Almost More Than The Heart Can Bear !" Kelly Sherwood has a tendency to mind her own business. She works in a bank and loves her sister. She suddenly finds herself in a position that she never thought she would be in. Someone has kidnapped her sister and promises to kill her if Kelly does not do what she is told to do. The kidnapper wants her to help him steal money from the bank. Kelly attempts to cooperate, but she is told not to contact the police in the matter. Her decision about whether to contact them or not could cost her sister’s life. 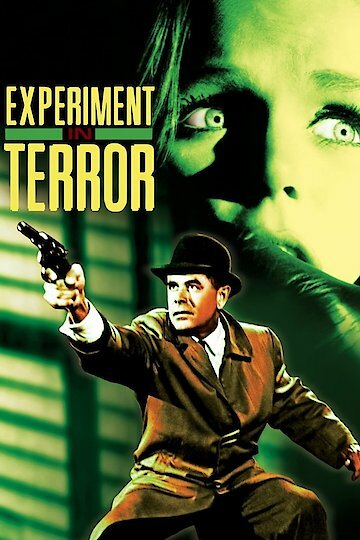 Experiment in Terror is currently available to watch and stream, download, buy on demand at Amazon Prime, Amazon, Vudu, Google Play, FandangoNow, iTunes, YouTube VOD online.